A pack of 50 wipe-clean cards with over one hundred doodling opportunities that can be used again and again. Doodles include designing a flight attendant’s uniform, drawing a route so the train can get to the train station and doodling monkeys in the safari park. Includes a special pen to draw on the wipe-clean cards. 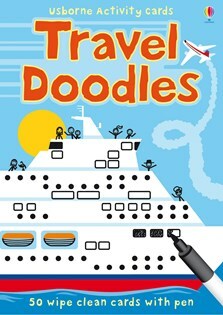 Travel Doodles gets the user copying the view from the train window, adding surfers to waves, designing an outfit for a day at the theme park and a host of other ideas that will make any journey less arduous.